Professional arborists are aware of the need for optimal safety at all times when climbing trees or poles, one key part of their climbing kit is their climbing spikes. 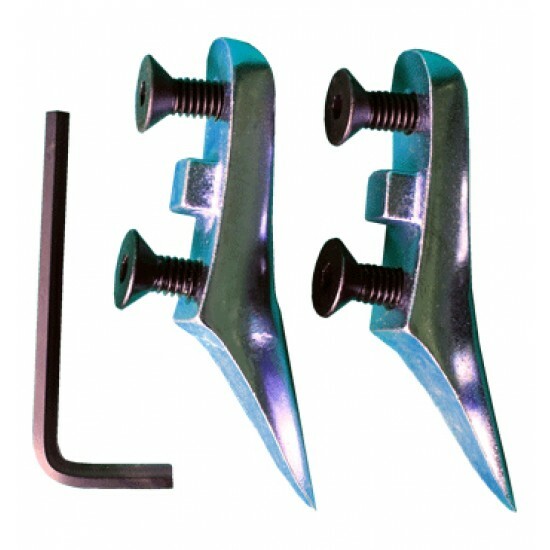 Short gaffs are a component of any set of climbing irons, however, over time, they begin to wear out and require replacement. If you need to replace your short gaffs to stay safe while carrying out your work, these replacement 43mm spares for the Stein X2 climbing irons can be done quickly and easily. Coming complete with everything you need to carry out the replacement, including an Allen wrench and gaff screws, these 43mm gaffs are strong, durable and resilient, ensuring your safety in the long term. As a genuine replacement part for Stein climbing irons, you’ll have nothing to worry about, and you can be assured that they will fit perfectly on the Steim X2 model to restore your equipment to full working order. There is also a 67mm version of these short gaffs available for use as replacements in the appropriate Stein climbing irons. You can find them here.